Turn to your local women’s organization or shelter to gain more knowledge regarding the prevalence, and ways you can support to end, gender-based violence in your community. With a myriad of resources available, ensure you look to a diversity of organizations, including Indigenous, LGBTQ2S, Anti-Black Racism Organizations, ethno-cultural agencies, disability agencies, senior and youth-based organizations. Understanding the colonial roots of gender-based violence is pivotal in exploring all forms of violence against women, girls, men and boys. Aboriginal women (First Nations, Inuit and Métis) are more than eight times more likely to be killed by their intimate partner than non-Aboriginal women. Aboriginal women are 3.5 times more likely to be victims of violence compared to non-Aboriginal women. Native Women’s Association Canada (NWAC) has estimated that roughly 600 Indigenous women and girls in Canada have gone missing or have been murdered over the last two decades. The majority of these cases remain unsolved (NWAC, AFN Workbook 2013). According to both police-reported and self-reported data, younger women are at a much higher risk of violent victimization. 66% of all female victims of sexual assault are under the age of twenty-four (11% are under the age of eleven). The rates of violent crime against women aged 15 to 24 is 42% higher than rates for women aged 25 to 34, and nearly double than the rates for women aged 35 to 44. Women aged 15 to 24 are killed at nearly three times the rate for all female victims of domestic homicide. Gender-based violence can take many forms, including (but not limited to): physical, sexual, emotional, verbal, financial, spiritual, criminal harassment/stalking, cyber-violence, neglect. 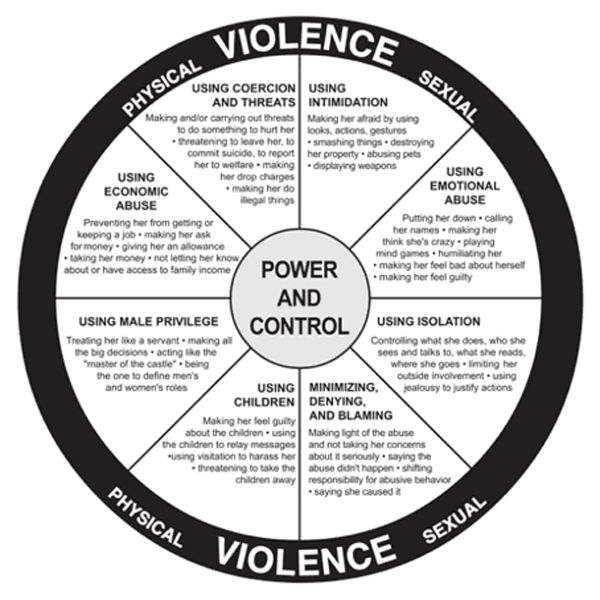 See the Power Wheel for the different forms of male violence against women. Colonialism and broader gender inequality lie at the root cause of gender-based violence in Canada and beyond. Indigenous women and girls are 5 times more likely to experience violence due to structural inequalities and colonialism. Each individual incident of gender-based violence happens within a broader culture which is steeped in victim-blaming, devalues survivors experience and male accountability for choosing to use violence. Together, we can challenge this culture and push for male accountability and women and girls’ rights. IFFs attempt to understand how multiple forces work together and interact to reinforce conditions of inequality and social exclusion. 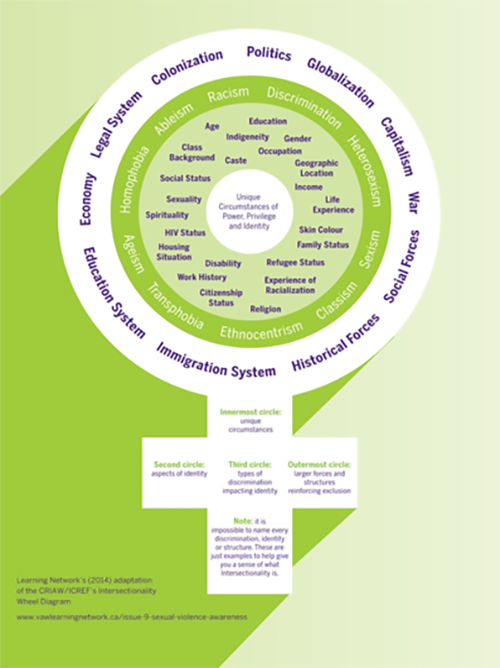 IFFs examine how factors including socio-economic status, race, class, gender, sexualities, ability, geographic, location, refugee and immigrant status, combine with broader historical and current systems of discrimination such as colonialism and globalization, to simultaneously determine inequalities among individuals and groups (Canadian Research Institute for the Advancement of Women, 2006, P. 5). Approaches that seek to transform gender roles and promote more gender-equitable relationships between men and women (World Health Organization, 2007). Any act of gender-based violence that results in, or is likely to result in, physical, sexual or psychological harm or suffering to women, including threats of such acts, coercion or arbitrary deprivation of liberty, whether occurring in public or in private life (United Nations, 1993). At its root, gender-based violence occurs due to discriminatory attitudes and behaviours because of a person’s gender, gender identity and/or sexual orientation. 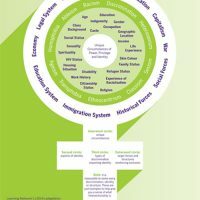 Gender-based violence occurs within broader systemic inequities and patriarchal institutions which undermine women and girls human rights. Gender-based violence can also, and increasingly does, permeate digital spaces and online forums. A journey in unpacking one’s male privilege and power, and identifying ways in which more inclusive and equitable spaces can be nurtured. Being a male ally for GBV prevention can include the following; a personal commitment and sense of responsibility in better understanding diverse women and girls’ realities, listening to experiences of survivors, using one’s voice to amplify women’s perspectives and challenging sexist and discriminatory comments and behaviours, being cognizant of one’s power and privilege in all spaces. Men and boys should be encouraged to identify entry points in their own lives where they can be an ally. Being a male ally is a journey, and not an identity one can assume or “obtain”, rather a continuous process of rethinking one’s power and privilege. Male-identified people should challenge their power and privilege, and act in ways which are rooted in respect and value women and girls’ full human rights. Healthy masculinities assume peaceful actions, equal power relations and a love for one’s whole self. Adopting healthy masculinities is a part of social norm change, and challenging male dominance. Individual men and boys should take the time to define this for themselves. Challenging toxic masculinity is an exercise we encourage all men and boys to do. White Ribbon met with each project partner across Canada from Whitehorse, Yukon to Middleton, Nova Scotia. The team conducted nine project site-visits and engaged each CoP organization to share its unique perspective on the various successes and challenges they were having in engaging boys and men in gender-based violence prevention programming. Each community has its own set of actors, be they community organizations, public institutions, government, interest groups, sports teams, media outlets, individual leaders and many others. Some of these groups and individuals are more aware of the issue and underlying causes of gender-based violence in their community than others. The willingness of community members to talk about, acknowledge and address violence against women and girls in their community is a product of their readiness. Readiness also refers to the capacity that the community has to provide safe spaces for men and boys to engage in conversations that challenge gender norms, toxic masculinity and identifying positive roles they can play to promote gender equality broadly, and prevent GBV. Interventions utilized for bringing about impacts in each community differed, as did how they were evaluated. The culture of the community consists of the set of values and beliefs held in common, which ultimately influence what approaches are generally accepted and eventually become legitimate. In a youth detention center the culture was quite different than in a local community hub in Winnipeg, or northern and remote communities. These contexts merited quite different and culturally relevant approaches in all aspects of the male engagement strategy. Materials and approaches had to mirror the culture of the individuals they were used to engage. Some communities expressed a strong resistance amongst some institutions they encountered to acknowledge gender-based violence (GBV) or sexualized violence as an issue. Organizations undertaking gender-based violence prevention work in other communities found that institutional leaders were more than willing to play a role in the work. These institutional leaders acknowledged GBV as a problem and even requested training for their staff. The issue of language arose, and a careful balance needs to be considered in using “healthy relationships” and not undermining the inherently political nature of this work, to transform unequal power relations. In many communities the issue of GBV was not viewed as an issue because often incidents were not reported or publicized. Most experienced a backlash when exposing GBV as a problem in a community where members of that community were not made aware of the issue before. The awareness level of the community greatly impacted their willingness to listen and engage in discussions on the issue of GBV. Generally, the higher the awareness and visibility, the greater the willingness to participate in discussions about the topic. Social norms are at play in every human interaction and can be characterized as those unwritten rules implied in our behaviour that go largely unnoticed. Each program depending on where it was being delivered had to take into account the norms that it was following and those it was attempting to challenge. For example, programs that held workshops with mixed gender groups and single gender groups operated with a different set of social norms. The way men and boys socialize and participate in a workshop when women and girls are present is different than when they are by themselves. Certain words, phrases, expressions, body language, attitudes and behaviours are more prevalent and some are non-existent. Leadership, skills and competencies in each organization differed greatly and so did the capacity of the partners they engaged. Some were well equipped with staff that could champion GBV prevention and others had to develop skills and capacity as they implemented their projects. Also the men and boys engaged in the program started at different points in terms of their age, level of understanding regarding gender/masculinity and GBV, education, attitudes, etc. In many cases the programs were designed to develop the capacity of the participants and then rely on this capacity to further champion the project in the community. This meant that the capacity of the participants to some degree became the capacity of the organization to influence broader change. Whether rural, urban, northern and remote the geographic landscape of the communities engaged, had characteristics, significantly impacting the programs, interventions utilized and approach taken. Isolation of northern and remote communities is often challenging to overcome. People needed to connect over great distances to have conversations about GBV and many programs required travelling great distances. Technology was one solution that helped to bridge communities and open up communication channels to address GBV. It is important to recognize that the sense and perception of space and time shifts depending on the landscape and community one lives in. Geography also impacts how social networks operate and how people congregate and associate. These differences need to be taken into account when designing or implementing community-based programming to respond and prevent GBV. Likewise, the outcomes that a program may be expected to achieve will need to be relative to the geography of its participants. Power dynamics are not uniform across communities and many are built on a stronghold of traditional gender-construction that have been male-dominated, including social networks, businesses, institutions and local government. Although many of the cultural influences today have begun to erode the nexus of power and control quietly exercised by a male-centered discourse, many of the programs and interventions addressing GBV challenged this prevailing paradigm. The narrative of a dominant discourse will often subvert and override direct opposition. The degree to which the individuals in a community have been successful in challenging and opening up this traditional, male-centered discourse may determine how successful new programs and interventions (addressing GBV for example) will be. This is to say that the success of GBV prevention work may rest to a large extent on the historical evolution of the discourse in that community. Repression, denial and the violence of language and interpretation may be a force against progress when it comes to unpacking toxic masculinities, power and entitlement; combatting these will be a core challenge in every program and community. Some communities are more resource rich than others. This is a contextual factor that greatly impacts the chances of success and a programs chance of sustaining itself long-term. Despite the fact that many communities have less resources or opportunities to access financial resources, many groups were still able to appeal to the good will of other organizations and institutions and access in-kind contributions. Access to financial support and in-kind resources affects the sustainability of the program and just how much each program could leverage based on the funding received from Status of Women Canada. This connects back to the readiness of a community to take on GBV prevention work as much of it needs to include the costly and time consuming efforts of engaging other organizations and partners and leveraging small amounts of funding and in-kind contributions to make this work successful. Although there may be indicators of this at the outset, it is challenging to predict the likelihood of success based on an initial needs assessment. In many cases, those who came to the table and the specific contributions they would be able to make throughout the project shifted and changed. The connectedness and functioning of social networks in different communities have diverse characteristics which greatly affects the approach that should be taken to transform social norms in a community. Some communities have very strong connections where information is transmitted and awareness can be raised more quickly. In some rural communities for example, word-of-mouth may have swift influence because families are connected throughout the same social circles and congregate in similar places or have one or two individuals they go to for information. In communities where groups are more disconnected, different and diverse strategies may be more effective. This relates to the concept of marketing mix, which implies that it is about finding the right mixture of communication strategies to reach the population that is being targeted. Reaching individuals in a highly dense population like an urban area may require multiple kinds of communications, strategies and methods to be utilized and figuring out what types of social networks have a high degree of conductivity will be essential for maximum effectiveness and reach.